LYØ AND AVERNAKØ. By closely studying the schedule you can manage to visit both Avernakø and Lyø on the same day, but check which island you come to first as it changes throughout the day. After a beautiful ferry crossing, you will arrive at the island of Lyø. 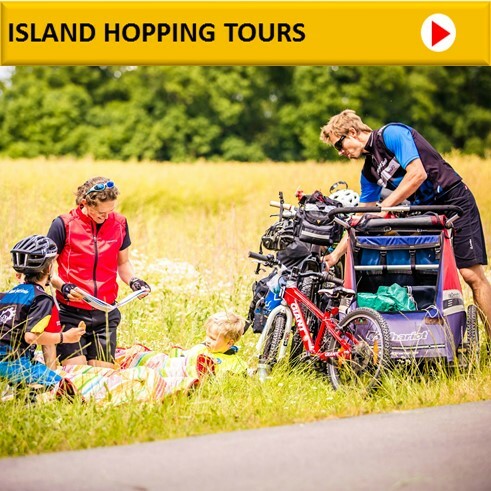 From the ferry harbour you will cycle directly to the village of Lyø By, where you will find the island's grocer. Avernakø originally consisted of two islands, Avernak and Korshavn. The two island were joined in 1937 when the causeway, known as "Drejet", was built. Avernakø is 8km long and you can find a grocer and a number of farm shops on the island. Avernakø is one of the few places in Denmark that still carries on the tradition of raising Maypoles. On Pentecost, one Maypole is raised in Avernakby and another Maypole is raised in Munke.